Or 50% down option ($900usd), and remaining 50% + ship at completion of illusion build. “Impassable” is J C Sum’s latest innovation of the “3” Hole Trunk”, originally based on inspired by Jim Steinmeyer’s “Through a One-Inch Hole” Illusion. The new design is a big leap forward in the psychological effect of the illusion for the audience. 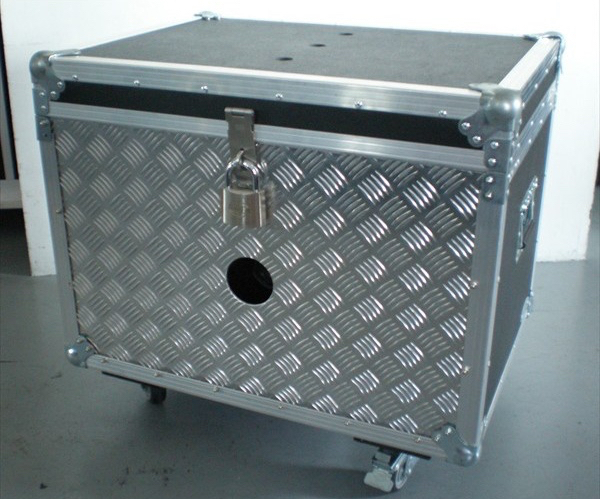 This is a practical two-person illusion that sees a girl pass through a 3” hole in a diamond plated metal plate; into a solid locked ATA case. J C has completely redesigned the workings of the illusion to ensure a smooth operation with a prop that will stand the rigours of a professional show. J C’s specification for the material-combination used ensures that the entire illusion is very lightweight but durable. **The illusion does not include the “All-round Curtain” but you can request one to be made in your choice of fabric.